Know a bunny lover? Benedict and Chloe are absolutely darling--just look at those glasses and that little skirt! 13" doll: $45. 20" doll: $65. Sweet dreams of underwater kingdoms are sure to await your little mermaid! 13" doll: $45. 20" doll: $65. Sweet Maximus is suited up & ready for winter adventures! 13" doll: $45. 20" doll: $65. Love these little animal faces? Grab a matching print! 10x10 print, $20. Your little one is sure to adore the ruffled hat on Chelsea the Cat. 13" doll: $45. 20" doll: $65. Looking for more great gift ideas? See the entire Christmas Gives Back Idea Book here! A look at The Shine Project, a non-profit providing scholarships to inner-city youth, and a selection of their fabulous jewelry that supports the cause. Wintertime means a wardrobe of warm hats, gloves, scarves and sweaters, so why don't you share the warmth by giving a hand knit or crocheted item from Krochet Kids International? This non-profit organization hires women from Northern Uganda and Peru, teaching them to crochet and weave, employing them to make the items that they sell in their stores, and using the profits from these sales to educate, mentor, and empower a generation of women. Krochet Kids was founded by three guys who loved winter sports and learned to crochet so they could have an endless supply of unique hats on the mountain. Their unique hobby attracted attention from their peers, and soon they were taking custom orders and selling their wares to help pay for prom. When you purchase crochet and knit items from Krochet Kids International, you are directly investing in these artisans, supporting their work and their futures. Your beautifully hand-made item will come with a tag inside, signed by the woman that created it. What a thoughtful and impactful gift to give this season! Here are a few of our favorite things, but there are so many beautiful items to choose from! Click over and visit their shop today! Looking for the rest of our Christmas Gives Back Idea Book? Click here to see the full catalog of ideas! Ever wondered what to get some of the guys in your life? How about a candle that smells like bacon or a new leather baseball glove or freshly cut grass? Man Cans are candles scented for men. Forget florals and sweet smells, these candles are infused with a heartier scent. Each candle is poured in a soup can with a manly brown paper wrapper, and the simplicity of the design is part of the genius of this social enterprise. Man Cans was founded in 2010 by a kid, then-13-year-old Hart Main, who (during his sister's candle fundraiser for school) wondered why companies didn't make candles with scents that appealed to men. So, he set about to make his own candle, deciding that a soup can would be the perfect vessel. Along the way, he decided he wanted his company to do something for his local community, so he began purchasing soup, donating it to local soup kitchens, reclaiming the opened cans and then pouring his candles inside. Thus, Man Cans was born. In the beginning, mom did all of the actual pouring (Hart wasn't allowed to mess with the hot wax). In later years, Hart began taking a more active production role, but then the company's success made a small kitchen enterprise impossible, so Hart decided to hire out the pouring. He chose Beaver Creek Candle Co., which exclusively hires mentally and developmentally disabled employees to work in their facilities. When you purchase a Man Can, not only are you providing a job for the mentally and developmentally disabled, you are providing meals for the disadvantaged at shelters across the country through Man Can's "One Candle, One Meal" pledge. So this Christmas, spice up the ambience of your home with a 'Santa's Beard' scented candle. Grab a Gunpowder scent for your favorite hunter. And the Memphis BBQ scent would be perfect for the guy that likes to fiddle with the smoker out back. Whatever scent you choose, your candle will feed the hungry and provide employment for the disabled--that's an awesome gift to give! Looking for the full Christmas Gives Back Idea Book? Need a few more ideas for gifts? Click here! Simple. Elegant. Sustainable. Those words describe the jewelry of Hands Producing Hope and their mission. Founder Rebecca Gardner encountered the Guaymi people of Coast Rica and felt drawn to their story. Marginalized, discriminated against and ostracized, the Guaymi people frequently live on reservations with little hope for the future. Rebecca and an in-country family of missionaries started Hands Producing Hope with the idea that "all people (regardless of gender, ethnicity, or geographical location) be afforded opportunities to have dignified and respectable work, and to provide for their families and flourish in their communities." Now, Hands Producing Hope is operating in two countries: Costa Rica and Rwanda. They hire and pay artisans above-living-wages to create the jewelry products, frequently using indigenous seeds or natural elements in the jewelry. The artisans and their families are welcomed into the HPH community, which teaches them life skills, provides educational and training opportunities for future advancement, and are taught about the incredible love that Jesus has for them. Hands Producing Hope involves the larger community to be a part of their mission, and as relationships are formed between the Guaymi people and the surrounding communities, small steps are being made toward racial reconciliation. Intro pt. 1 // Hands Producing Hope from Hands Producing Hope on Vimeo. So many lovely options, sure to delight your gift recipients! Top left: Orlando Bracelet $15. Top right: Kaia Necklace $24. One of my favorite smells is the scent of leather--isn't it just divine? (Although, our vegan friends may not share that opinion.) And I love how quality leather develops more character over time--it gets even more lovely after years of use. But hand-stitched leather goods have come under intense scrutiny in the pat few years, as laborers in developing nations are often paid a pittance to stitch the goods in deplorable working conditions. However, you don't have to give up your love of leather goods entirely! Meet Mission Lazarus, a social enterprise that works in rural communities in Honduras and Haiti to provide opportunity. The impoverished are invited to attend Mission Lazarus free vocational schools where they learn sewing, how to create leather goods or are trained to work on one of their organic agriculture farms producing coffee. All students and employees are paid a living wage that is 25% higher than the established, local Fair Trade wages and all employees are eligible for healthcare. Looking for the full Christmas Gives Back Idea Book? Click here to see the entire collection. I know what you're thinking: socks for Christmas? Seriously? But when they're this fun, fashionable and functional, how can you resist? Cool funky patterns, bright colors and hi-tech basics for athletic performance, these socks aren't your ordinary box-store footwear. Mitscoots gear is manufactured in the USA in plants located in Texas, North Carolina, New Jersey, New York and California, then packaged in a facility in Austin, Texas that employs transitioning homeless, giving valuable jobs to those that need them most. And every time you make a purchase, a similar, high-quality item will be given to the homeless, to help them stay warm and healthy on the streets. Mitscoots was founded in 2012 by Tim Scott and his wife, Agata. In their volunteer work with the homeless community, one of the most frequent requests was for socks and other gear, like hats and gloves. As Tim developed his business plan, he knew that providing quality gear to the homeless community would be a cornerstone of his business model. But Tim wasn't content to just give handouts of free gear--he knew that this was just a temporary fix, as even the most high-quality gear would eventually wear out. "Top-down charities are all about people receiving. There's no 'Let's do this together.' Restoring dignity is missing." One day, he had an epiphany, though: the socks would require packaging, sizing stickers and branding, and that's when Tim decided to hire the homeless to do the work. Mitscoots provides part-time employment that instills a sense of pride and dignity in those that are looking to work, but are frequently unable to secure employment because of their living situation. It helps to bridge the gap between shelter and street living to full-time employment. Mitscoots also partners with a variety of local nonprofits to make a holistic impact in the Austin homeless community. This approach allows them to meet the immediate needs of the homeless, provide a pathway to independence in the future, and engage the American workforce in creating a quality product for the consumer--it's a win-win-win-win. 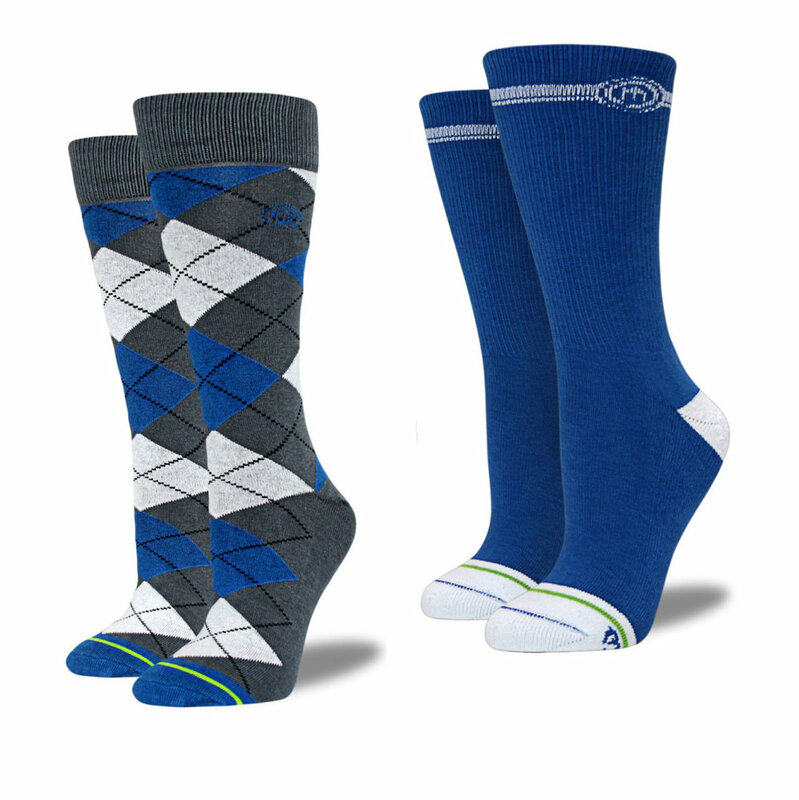 Whether your recipients' taste in socks is purely functional or runs more to the fanciful, you're sure to find a product to delight them. What a great stocking stuffer to give this holiday! Have an athlete in your life? Get them the hi-tech comfort they deserve! Feeling patriotic? Show your American pride with some classy stars and bars. Fall weather means permission to drag out the boots, and a pair of comfy, padded boot socks are a must. These houndstooth socks with the yellow trim are sure to brighten up the dreariest January day! Jewelry is a great choice for gifts: unless it's a ring, there's no need to worry about sizes and most every woman enjoys a sparkly bauble hanging from their neck or earlobes. But when you factor in the notion that jewelry from the Starfish Project will also bring hope to exploited women, it's a no brainer. Starfish Project was founded in 2006 by Jenny McGee. After studying abroad in college and getting a taste of China, she and her husband traveled to Beijing to learn Chinese and immerse themselves in the culture. While there, a friend who worked in philanthropy exposed McGee to the masses of women, many who had arrived illiterate to the city from rural areas, hoping to find opportunity, and ended up living horrible lives of abuse and exploitation in the city's brothels. McGee and her co-founder, Priscilla Daeger, decided to do something about it. McGee began making jewelry and using the proceeds to fund assistance for the women. She also began teaching the women how to craft jewelry themselves, and out of this modest start, a successful social enterprise was born. Today, Starfish Project can boast of many success stories: women that, not only have found healing from their past, but have developed longterm and satisfying careers. Women begin their journey with Starfish Project at one of their shelters, where they (along with their children) can find a safe, clean environment to make their fresh start. Counseling, Christian mentoring and comprehensive healthcare are provided to care for a woman's immediate needs. Vocational and life skills training are offered for women to begin their first steps toward independence (while their children are also given educational scholarships and opportunities), and women are employed making jewelry at a fair wage, with healthcare and retirement benefits. But Starfish Project's McGee wants more for these women than just a simple job. Each day there are computer classes for the women to gain Microsoft certification, and women are given the opportunity to learn photography, graphic design, marketing, accounting, and management skills in order to jump start a lifelong career. "My thought was to have them make jewelry while they learned to do something else," she explained to Kering Magazine. "Employing people to make something forever is not that thrilling to me," McGee said. "But seeing them able to do things they never thought they could do before is quite fulfilling." This Christmas, consider a purchase from Starfish Project. Your purchase will empower women to leave behind exploitive employment and find personal fulfillment and healing. And there are so many incredible options to choose from! With on-trend colors, this statement necklace will bring color to the most drab winter day. Know someone with a love for dangly earrings? With a modern flare and minimalist vibe, these earrings would look fabulous in the office or with your fave pair of jeans. A simple, elegant silver bar with a hand-stamped cross. An understated way to wear a visible reminder of your faith. This necklace and earring duo would look fabulous from morning to night, whether paired with a business suit, a worn pair of jeans and a classic white tee, or that little black dress we all have tucked into our closets. Did you miss the complete Christmas Gives Back Idea Book? Click here to see the entire collection! Christmas is a time of celebration and sharing gifts with loved ones, but wouldn't it be great if those gifts could also make an impact in the world? We've scoured some of our favorite non-profits and for-profit social enterprises to create this list of beautiful gifts. Not only will these treasures make your recipient light up with joy, they will also help to right a social injustice, create opportunity for the less fortunate, and bring hope to communities in need. Click through the Idea Book, and if you see something you like, click the image or the item name/price and you'll be taken directly to the item's purchasing page. Want more info on the organization itself? Click the logo and you can read about how your purchase will be used to make an impact. PS--On a mobile device? Rotate your device sideways for a better view!